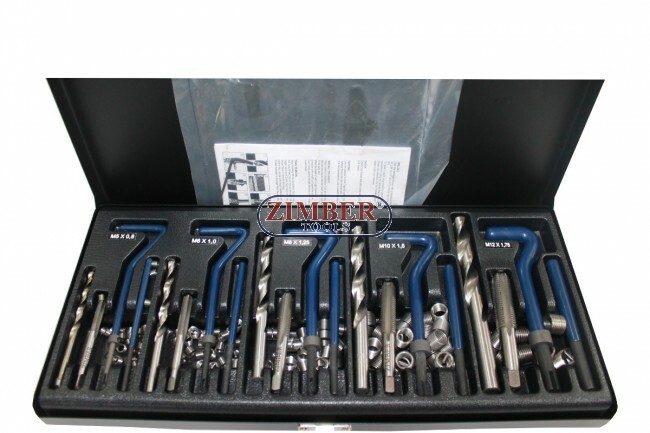 Trusă de reparat filet M5,M6,M8,M10,M12 - 131 bucati, ZR-36TRWK01 - ZIMBER TOOLS. -trusa contine kituri pentru reparat urmatoarele filete:M5,M6,M8,M10,M12. -inlocuieste un filet rupt la aceeasi dimensiune -contine 131 bucati. Trusă de reparat filet 131 bucati, ZR-36TRWK01 - ZIMBER TOOLS. -trusa contine kituri pentru reparat urmatoarele filete:M5,M6,M8,M10,M12. -inlocuieste un filet rupt la aceeasi dimensiune -contine 131 bucati. Product Description. Manufactured from chrome vanadium steel for strength and durability. -Ideal for restoring damaged threads in steel, cast, iron and aluminum. -Suitable for engine repair and other automotive applications. -Simple and easy to use :- Drilling - clear the damaged threads with a standard drill. (to repair a spark plug thread no pre-drilling is necessary if using the special spark plug tap), please pay attention that for fluteless taps bigger holes are required. Check - check that the thread and pitch of the tap and the bolt match Tapping - use the special taps for cutting the holding thread into the cleared hole (recommended to use a suitable cutting oil) Install the insert - place insert on installation tool and position the adjustable ring so that the insert tang is centered in the tang slot. Wind the insert in with a light downward pressure until a half turn below the surface. Don't work against the thread direction as the tang could break Tang removal - After finishing lift the installation tool and use the tang break tool to remove the tang. For bigger sizes and spark plug taps use long nose pliers to remove the tang. Trusa pentru montat filete din otel contine 131 bucati - M5,M6,M8,M10,M12. 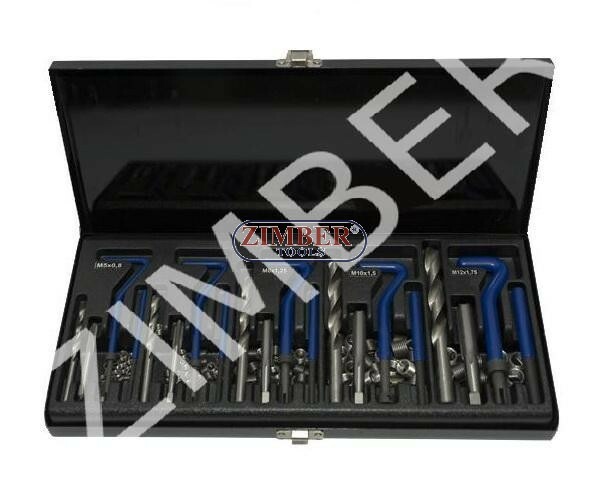 (ZT-04044) - SMANN TOOLS. Trusa reparat buson baie ulei - M13x1.5 (ZT-04166) - SMANN TOOLS. Trusa reparat buson baie ulei - M15x1.5 (ZT-04167) - SMANN TOOLS. Trusa reparat buson baie ulei - M17 x 1.5 (ZT-04169) - SMANN TOOLS. Trusa reparat buson baie ulei - M20x1.5 (ZT-04169) - SMANN TOOLS. Trusa pentru montat filete din otel M10*1.25*13.5MM, 15-buc(ZT-04187E) - SMANN TOOLS. 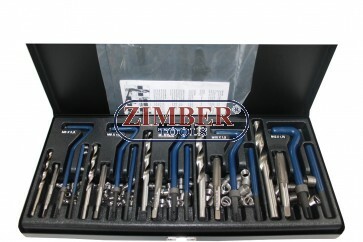 Set de Reparatie Filet Baie de Ulei Motor M13-M15-M17-M20 - 64.buc - ZT-04A5037 - SMANN TOOLS.